Kupallie (Midsummer) is an ancient pagan festival which marks the summer solstice – the longest day and shortest night. This holiday is one of the four most important in the pagan calendar. When the Slavs were converted to Christianity, the Church designated the day as the feast of John the Baptist in order to destroy the holiday’s pagan roots. However, nearly 1,000 years of pressure from the Church were not able to completely wipe out the celebration's pagan connotations. When Belarus switched to the Gregorian calendar, the Church began to celebrate the holiday on 6 July, which distorted the holy day’s compliance with astronomical phenomena. Nowadays, Belarusians celebrate the holiday in two ways, both of which we present here. We will showcase the way in which enthusiasts celebrate, at night and following old traditions, and the way in which governmental Culture Centres mark the occasion. About the photographer: Siarhei Leskiec is a freelance photographer whose work focuses on everyday life, folk traditions, and rituals in the Belarusian countryside. Originally from Maladzeczna Region, he received a history degree from the Belarusian State Pedagogical University. This June the Ostrogorski Centre launched the Ostrogorski Academy – a nonprofit educational project dedicated to disseminating knowledge of the humanities. The academy is the first Belarusian entirely online ‘university’, based on a series of lectures, tests, podcasts on important and engaging topics. Ostrogorski Centre analysts discussed how Belarus’s neighbours doubt its sovereignty, brain drain, and religiosity in the country. The Centre also held in Minsk the Ostrogorski Forum 2017, which focused on foreign policy, security, and identity. On 19 June, the Ostrogorski Centre officially launched the Ostrogorski Academy – a nonprofit educational project dedicated to disseminating knowledge of the humanities. The academy is the first entirely online educational platform, based on a series of lectures on important and engaging topics. Each lecture series is read by well-known Belarusian academics and analysts based both abroad and in Belarus; courses also feature graphic illustrations, transcripts of lectures, e-books, podcasts, and links to additional sources of information. On 19 June, the Ostrogorski Centre held its 2nd Ostrogorski Forum, which was entitled ‘Belarus in the new environment: challenges to foreign policy, security, and identity after 2014’. The event and in particular remarks made by the Ukraine’s Ambassador to Belarus were widely covered in the Belarusian media, including TUT.by, zautra.by, thinktanks.by, Polish radio, and Radio Liberty. You can see videos from the conference below. Siarhei Bohdan showed that despite all of Minsk’s efforts to present itself as a neutral country, some of its neighbours doubt not only its neutrality but even its sovereignty and commitment to peace. Minsk’s efforts have failed to please at least some of its non-Russian neighbours, which would like to see Belarus distance itself more clearly from Moscow. The Belarusian government, however, can hardly pursue a policy other than a very cautious and incremental build-up of neutrality if it wants to survive as an independent state. Alesia Rudnik analysed brain-drain trends in Belarus. According to official statistics, Belarus is among the few countries in the Post-Soviet region with more people coming to the country than leaving. Nevertheless, sociologists point to a discrepancy between official statistics and reality. 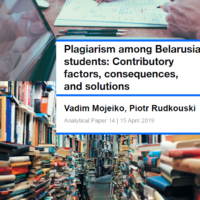 The economic crisis, political pressure, and stagnation of education are just several reasons Belarusians are leaving the country, while the authorities do little to influence Belarusians to stay put. Paula Borowska discussed a recent study on religiosity in Central and Eastern Europe by the Pew Research Centre with a focus on Belarus. According to the study, the overwhelming majority of Belarusians believe in God and affiliate themselves with specific religious organisations. Nevertheless, the number of practising believers who regularly engage in religious activities is far smaller. Unexpectedly, Belarusian Protestants, not covered in the study, might be the de facto leaders on the ground. On Polish Radio, Siarhei Bohdan argued that Belarus is moving away from its old security doctrine which ties it exclusively to the union with Russia. The Belarusian government is developing a more balanced foreign policy by creating a variety of partnerships in the area of security. It respects the interests of Russia while attempting to strengthen cooperation with the West. On Radio Liberty, Yaraslau Kryvoi discussed how Belarus’s presidency of the Central European Initiative could help the country break with its international isolation. Its presidency will garner the attention of the European community, help balance its foreign policy, and boost regional cooperation. Also on Radio Liberty, Yaraslau Kryvoi discussed the results of snap elections in the UK and how they could affect London’s negotiations with the European Union on Brexit. Siarhei Bohdan commented for thinktanks.by on the blockade of Qatar by a Saudi-led Arab coalition. The ultimate goal of the blockade is to put pressure on Iran, which aims to restore the military part of its nuclear programme. Belarus, which has been actively cooperating with Qatar, is losing an opportunity in the region due to the conflict. Ryhor Astapenia wrote an article for the Polish magazine Kontakt discussing the fall in support for Aliaksandr Lukashenka in Belarusian society. On Polish Radio, Vadzim Smok discussed a recent series of arrests of important Belarusian businessmen. In Belarus, they can not freely do business without informal arrangements with the country’s leadership. According to the official version, the businessmen were tried for tax evasion, but the actual cause may also be a conflict in the system of informal relations with the authorities. Siarhei Bohdan commented to Deutsche Welle on the recent oil agreements between Belarus and Ukraine. The Kremlin sees all attempts of its clients to diversify oil supplies in non-economic categories of confrontation – you are either with or against Russia. At the same time, the transition to a new structure of oil supplies from Iran and Azerbaijan via Odessa to Brody and Mazyr, and from there on to Eastern Europe, could change the geopolitical map of the entire Eastern European region. On Polish Radio, Alesia Rudnik discussed alcohol policy in Belarus. The country continues to occupy top positions in the WHO’s world alcohol consumption ranking. What’s more, these statistics do not take into account illegal alcohol stock. Although the state claims to be working on some anti-alcohol policies, this seems to be in word only, and alcohol remains extremely affordable. The BelarusProfile.com database now includes the following people: Jury Karajeŭ, Alieh Chusajenaŭ, Iryna Abieĺskaja, Mikalaj Lukashenka, Michail Zacharaŭ, Paviel Cichanaŭ, Alieh Rummo, Jury Hurski, Piotr Kraŭčanka, Aliaksandr Dziamidaŭ. We have also updated the profiles of Siarhiej Pisaryk, Aliaksandr Kosiniec, Natallia Nikandrava, Siarhiej Ciacieryn, Siamion Šapira, Fiodar Poŭny, Anatol Kupryjanaŭ, Viktar Marcinovič, Aliaksandr Miažujeŭ, Liudmila Michalkova, Anatol Rusiecki, Marjana Ščotkina, Mikalaj Samasiejka, Siarhiej Michalok, Georgy Ponomarev. Andrei Yahorau, Andrei Shutau, Mikalai Katsuk. Civil society of Belarus: current state and development conditions. CET, 2017. Andrei Yahorau, Aliona Zujkova, Volha Lashkevich, Ihar Rasolka. Potential and opportunities for implementing local planning mechanisms in the Belarusian regions to ensure the rights of people with disabilities. CET, 2017. Sierž Naŭrodski. Population 50+ in Belarus: the experience of using the instruments of social harmonisation in the EU. CASE Belarus, 2017. Monitoring Report on Implementation of Belarus Roadmap for Higher Education Reform (June-December 2016). Belarusian Independent Bologna Committee, 2016. Monitoring report on implementation of Belarus Roadmap for higher education reform (January-May 2016). Belarusian Independent Bologna Committee, 2016. Think tanks in Belarus are encouraged to submit their research for inclusion into the database by emailing us.